Time for a toddler superman costume! Your little guy is a superhero, after all, even if he doesn’t have any obvious special powers. Putting on a toddler superman costume may be just fun, or it may be an opportunity for him to throw all his normal insecurities to the wind and feel like superman for the afternoon; an invincible hero roaming here and there to rid the world of injustice. The simplest superman get-up is simply to give your child a piece of red material to use as a cape, and let him find the most appropriately colored clothes from his regular wardrobe to put underneath. 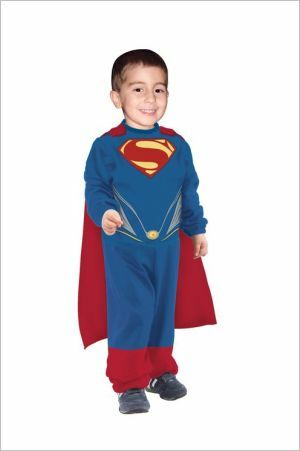 If you’re prepared to do a little more work, sew him a toddler superman outfit by modeling a close-fitting jumpsuit on one of his night-time sleepers. Red and blue are the colors you want. Unless you particularly like making toddler costumes, it may make more sense to simply buy the outfit that will turn your little boy into superman. There are enough toddlers keen on getting into superman costumes that your options abound. Some superman costumes are rather flimsy, one-time-wear affairs; others are sturdy enough that your toddler will be able to reuse them whenever he feels the urge to play superhero. For a basic, one time wear costume,Rubie’s Superman Jumpsuit may be a good option. This is a simple polyester jumpsuit in the traditional superman colors, blue and red, and includes a bright red cap. It’s not extremely high quality—the material is slightly flimsy-- and it is meant to be worn over regular clothes, but it’s a nice budget outfit for a Halloween superman. If you’d like your little superman to have a muscle chest bulging out under his costume you may want to go with Rubie’s Deluxe Man of Steel Costume, a top-rated outfit that includes a foam muscle chest under the costume’s torso area. This outfit also comes with a cap and boot covers, and your child will certainly be a very convincing superman when he puts it on. The only downside to this costume is that the foam chest is uncomfortable for some toddlers; it’s a bulky, fairly nonflexible piece. On the pro side, though, it’s nice protective gear for when two little boys are playing sword fight. Another unique superman costume without foam padding is the Tiny Tikes Jumpsuit, a jumpsuit and cape in a slightly different style. This outfit may be slightly more comfortable for little people than either of other options, and your toddler will certainly look pretty ‘super’ wearing it. Accessories to go with your toddler superman costume abound, and these are also easy to improvise with things you can find around the house. Dress your child up and let him go off on his own private missions. It’s a bird, it’s a plane—no, it’s a toddler superman, bent and determined on doing good in the world!